Cinder-cone volcano! In the heart of Arizona, no less! Ah but these are inspiring words, and Sunset Crater Volcano lives up to expectations. 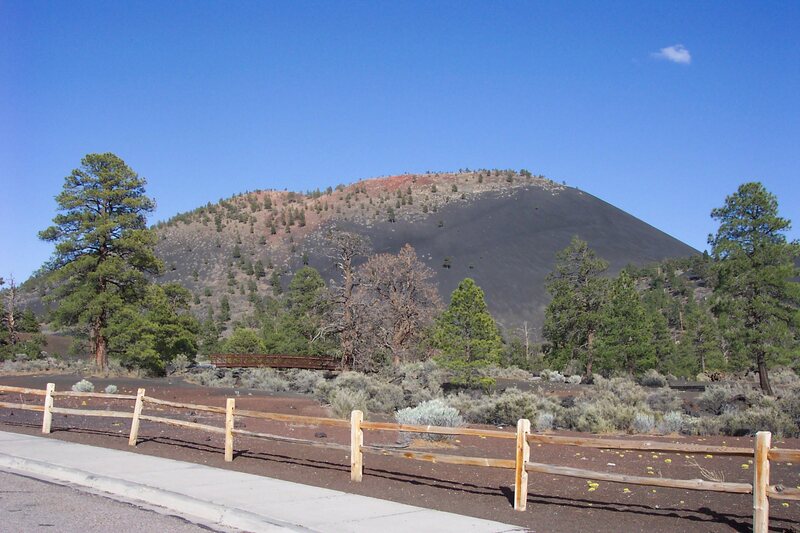 Formed less that 1,000 years ago, this volcano is but one of 600 volcanos that dot the Flagstaff area. As a matter of fact, Humphrey's Peak, the mountain that gives Flagstaff much of its pleasure (and that is Arizona's highest point) is but the shattered remains of an even larger volcano. 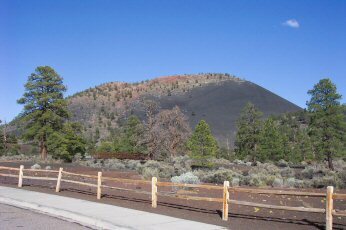 Sunset Crater Volcano started spewing out gases and cinders and lava bombs around 1064 A.D. Native indians then living in the area were eventually blessed as the soil was enriched by the dispersed nutrients. Over a period of 200 years, the 1,000-foot-high volcano was formed by constant eruptions. Two lava flows during this time destroyed all life in their path. Finally, around 1250 A.D., a final burst of activity saw red and yellow oxidized cinders shot out to fall around the rim. The striking colors observed at sunset led to the Volcano's name. Most impressive is the thousand-foot-high cinder cone volcano. 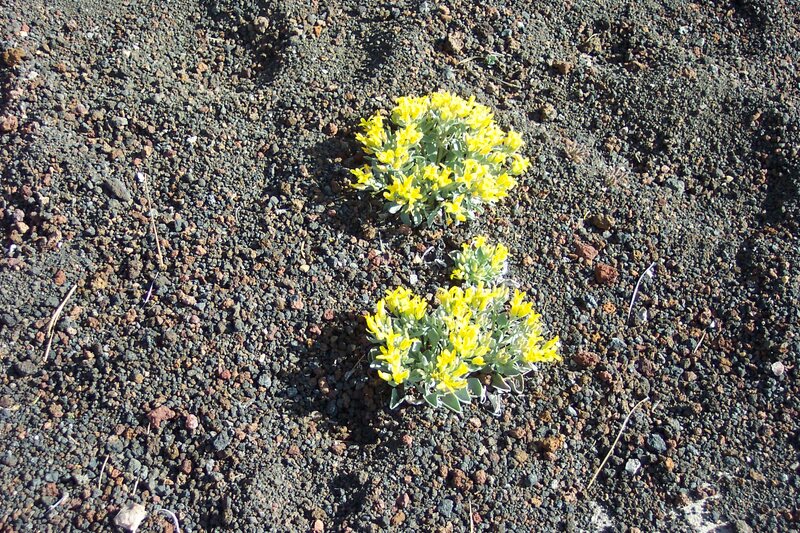 It's a volcano made up of individual lava-rocks, a loose formation that can suffer under visitors' tread. For that reason, the path to the top is closed now. 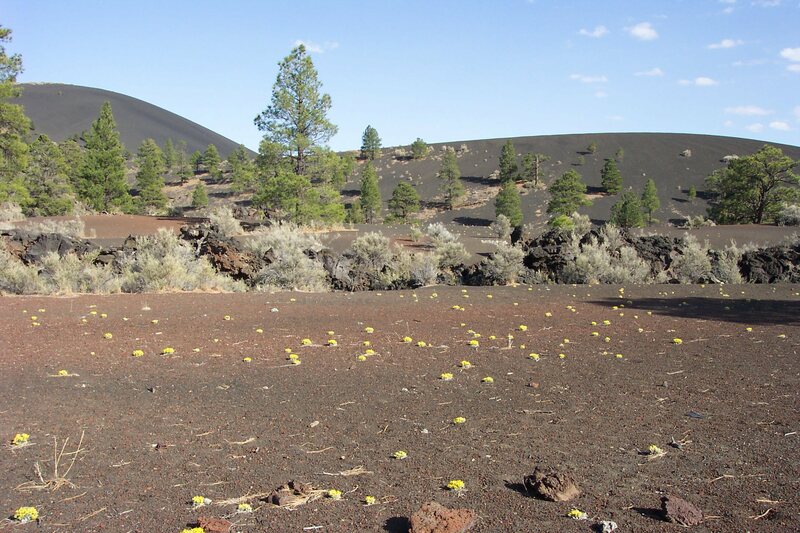 However, there is a fantastic Lava Flow Trail, one mile in circumference, that comes highly recommended. 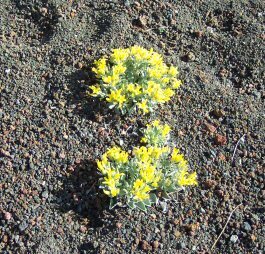 Along that trail you'll see lava flows, cinders, "squeeze-ups", and places where new vegatation struggles to gain a foothold. 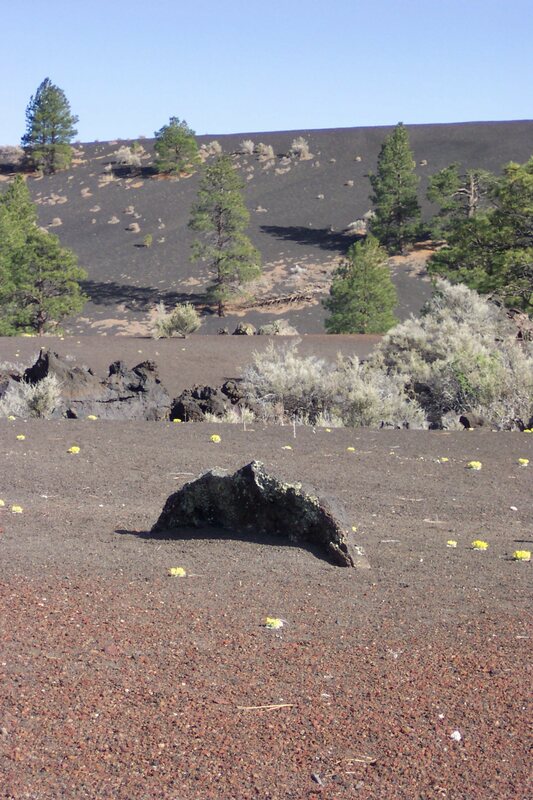 You also will see fumaroles and lava bubbles, all nicely cool since the last eruption was 800 years ago. Cinder volcanos of this type rarely erupt again, but then again, you never know. The Bonito lava flow is just under 2 square miles of lava, about 6 feet deep on the margin, and 100 feet deep in the center. There are also dozens of caves in this area, formed when lava tubes drained after the eruptions ceased. These caves are closed to the public for safety reasons. There is one cave along the trail that visitors can peer into. I love this place. I'm a geology nut, and a cinder volcano like Sunset is a magnet to me. The trail was fantastic; one of my favorite novels as a teenager was "Hawaii", and the best part was the description of how the volcanic islands were formed. I was able to see many different types of lava along the trail, and it was easy to imagine bubbling lava splattering all around me as cinders spewed from the cone, 800 years ago. There is a neat cave along the trail. Ice often forms inside, and we reached down to the bars that prevent deeper access -- it's cold inside! The kids enjoyed the path and the lava, but I had to caution them several times not to damage the delicate rocks. This place pleased me. Four subbies! 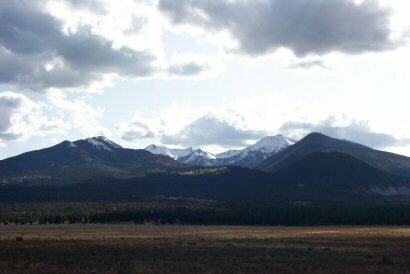 From Flagstaff, go north on Highway 89A for 12 miles. It's beautiful country. The turnoff is to the right. A circular 36-mile Loop Road will take you to Wupatki National Monument, and return you to Highway 89A again. About 60 miles to the northwest lies Grand Canyon National Park. Just ten miles north is Wupatki National Monument. About 100 miles north northeast is Navajo National Monument. About 100 miles east northeast are Hubbell Trading Post National Historic Site, and Canyon De Chelly National Monument. 15 miles southeast lies Walnut Canyon National Monument, and 50 or so miles southeast is Meteor Crater (privately owned, but worth the drive). To the south you'll find Tuzigoot National Monument, about 50 miles away, and Montezuma Castle National Monument, about 60 miles away, and Agua Fria National Monument, about 80 miles away. Visited August 2003 and April 2004.